Below are all the maps available in Digimon Masters. 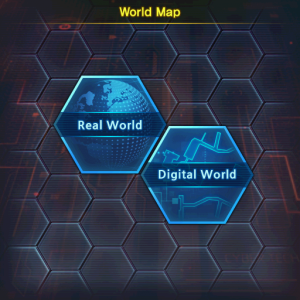 The game includes maps for both the Real and Digital World. An institution that specializes in dealing with trouble caused by the interaction between humans and Digimon. A restricted area where you need to have permission of Dats Center to enter. The emergence of Digimon was frequently reported in the Yokohama region of Japan. A Digimon rampage is the biggest threat to public safety. Unknown Land where everything is frozen. Mystery Island consists of data. Gigantic continent composed of vast server data. Code Crown is composed of Digital Data spread around the world. The site of rageful Four holy beasts for real world. A new digital world created by Yggdrasil. This page was last modified on 19 March 2019, at 04:57.